CCGS Gordon Reid is a 49.9 metre offshore patrol vessel weighing 879 gross tons. Its four Deutz 628 engines can produce 4800 horsepower, propelling Gordon Reid to a maximum speed of 16.5 knots. 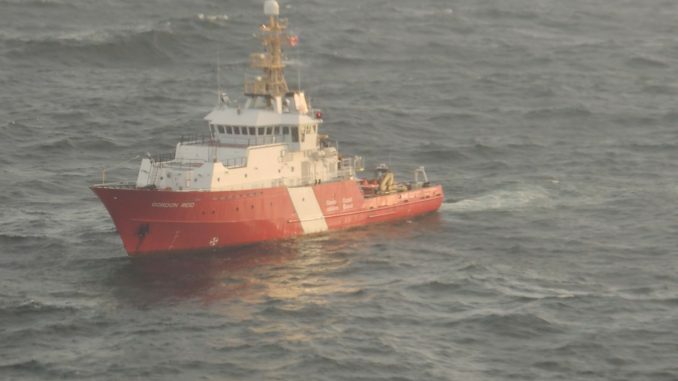 The vessel was built for search-and-rescue service in North Vancouver in 1990. According to Captain Michael Shuckburgh, Gordon Reid is not properly equipped to ‘tow for delivery’, meaning it is not intended to tow stricken vessels over long distances to deliver them to a port of refuge. After two lighter towlines broke away from Simushir, crews aboard Gordon Reid and Simushir agreed to attempt to use Simushir’s mooring-line as a towline instead. At the time of the rescue Simushir was at the whim of the weather and, without intervention, a vessel grounding was imminent. Gordon Reid’s contribution kept Simushir off the shore until American tug Barbara Foss arrived with proper towing capabilities 39.5 hours after Simushir’s first request for assistance.